A cultivar of Camellia japonica L., ‘Imbricata’ has formal double, carmine rose flowers, often with central petals streaked white. The name ‘Imbricata’ refers to the way that the petals are formally arranged, overlapping each other, like the tiles of a roof. [ICR]. ‘Bud, spherical, rather large, scales greenish; flower large, perfectly round, of a cherry-red, No.2; shaded with carmine-lake; petals from 70-75, regularly imbricated, oval, broad, terminating in a point at the summit; those of the centre a little striped, or marked with white; is a long time in bloom.-Magnificent.’ [Berlèse Monography p.64/1838]. Under the name ‘Imbricata rubra’ it is still available. [Hilliers’]. 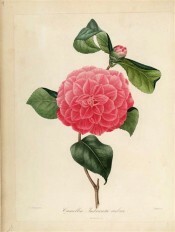 ‘A native of China, introduced to the garden of the Horticultural Society in 1824, by their collector, Mr. [John Dampier] Parks. It is a free growing kind, with rather lax branches: it flowers early, and is among the finest of the varieties, being very large and double, also in some instances beautifully marked.’ [LBC no.1974/1835]. First flowered in Britain in March 1827. [BR f.1398/1831]. Berlèse vol.I pl.8/1841. Listed in the 1850 and 1857 catalogues [T.232/1850]. ‘Imbricata’ is listed in both the 1830 and 1836 editions of Loddiges’ Nursery catalogue, copies of which are held at Camden Park [CPA]. In the 1836 edition it is marked with an ‘x’ which elsewhere denotes common before or long introduced. Its meaning here is not clear. It was included among desiderata in a letter to Loddiges’ nursery dated 6th January 1845 [MP A2933-2, p.28] and again on 16th April 1846 [MP A2933-1, p.147]. This is its likely source.